The Brainwavz came onto my radar through the year 2018. Reports via word of mouth and reviews from some of the more critical minded reviewers were glowing. like a couple of other earphones that appeared this year I had to try them out for myself and see what all the excitement was about. Its a great time for fans of portable audio gear as the quality keeps going up and in some cases the prices appear just right. One can build up a decent rig these days of (decent)phone/earphone, dap/earphone/headphone or phone/dac/earphone at a reasonable price and still get a wonderful result. Brainwavz had earlier sent two of their Hangers for headphones to Head pie and they have proven to be very useful. The Hengja being my favorite of the two sent. Earphones, case, cables and accessories galore! Two cables. Very spoiled and lucky. One with an inline mic for those busy chat on the go types and one without. The case is study and has a hard shell. "The main shells are printed using state-of-the-art liquid Resin 3D printers, enabling a shape not possible by normal manufacturing methods." The B400 have 4 Balanced Armature drivers. A range of colors are available. Ranging from US$175 - $200. The B400 have proved to be a popular fan choice for many users. An easy fit combined with a regular price and easy fit cable make these a great on the go earphone. The build seems fine, but I have not put it through much punishment. But I would expect one has to be a bit careful with them. Its a fairly fast earphone, Bass is moderate. Mids are fairly tame and seem to have impact in the lower mids than the higher mids. The treble seems designed to add a bit of detail, but does not seem to reach into sibilant areas, it does not possess that extreme top end shimmer and shine and is rather neutral with it. Yet extends far enough to wake on up. Such as the opening of The Chemical Brothers `The Sunshine Underground` which also demonstrates its adequate but not over blown bass. Sound stage is from medium to large but not expansive in all directions. Width is very wide, and depth medium, height is medium. Vocals are centered nicely within in the middle of the imagined sphere of my skull. Separation is good. I can pick out the placement of instruments well. Isolation is top notch with the right tips, I did not hear my son return home downstairs, nor could I hear him speaking up close to me (of course after wards I removed the earphones to hear about his day). The B400 is a crowd favorite for many users. It took me a while to find the right set of tips to give it the balance, cohesiveness, isolation and appropriate highs. The fit is easy as it is on the smaller end of IEM shells. It is a fairly smooth IEM that is in a competitive price point with many choices of IEMs in the same $200 price area. Quite pleasing to my ears with casual listening. B400 a smooth all rounder, a winner in the price bracket. Thank you to Brainwavz for sending Head pie the B400 for review. - Features of a custom, with universal appeal! Eartech is in my backyard and I do visit with Seth and Richard on occasion. Having said that, I have encouraged Eartech to make a universal in addition to their custom line. I think this makes great sense as a way for people to test the water without having to buy a custom. It also makes a lot of sense for worship teams who may have some rotating members, bands that have part-time members, or simply to have a spare in the gig bag that any member of the group can wear in a pinch. A few months ago, Seth let me know they had 3 universal models ready to demo. I made arrangements to spend a few hours at Eartech and listen to all the demos. I got to listen to two different tunings of triple drivers first and then they handed me a dual driver and said that several people had commented that it was the favorite tuning of all their in-ears (custom or otherwise). I was skeptical, but popped them in my ears and plugged in my Opus #1s/xCAN and sat back to listen. Wow! This is only two BAs? yep, its a new package from Sonion and a couple other tweaks we don't discuss (wiring and dampers). I'll take one as soon as they are ready to sell. What color do you want? Don't care, just so it sounds like that. And so the wait began. Then last week something good happened. I got a note from Seth. They're ready. So off to the shop again on my lunch hour to pick up my new duals. The Universal comes in a soft clamshell case with the Eartech logo and a nice carabiner to keep it in place. 6 set of tips (three silicone and three Foam) are provided in a small plastic case, along with your choice of two lengths of cables (50 and 66 inches). I prefer the longer version but many will prefer the shorter as well. I do find that the longer cable makes it easier for those of us that tend to carry our player in a coat pocket this time of year. The shells are made the same way as all of Eartech's custom models. Poured Acrylic in your choice of colors with additonal faceplate styles (wood or graphics) available. (See their build sheet for option prices). The shells are mid-sized with a nearly triangular shape with each side being roughly 14mm. The body is approximate 5mm thick and the nozzle protrudes approximately 7mm from the lead edge of the body. You wont find a rough edge anywhere on the shell and if you get the same color faceplate as body, it can be difficult to find the seam as these are hand polished after assembly. Bi-pin connectors are well fitted and again any seam can be hard to see if not really looking for it. This model contains two Sonion manufactured Balanced armature drivers. The bass driver comes from the series 2000 family while the mid/treble driver is a 2300 series model. A couple of other tricks in tuning the drivers involve dampers which for obvious reasons, Eartech doesn't want disclosed. Nominal impedance is listed as 21Ω with a sensitivity of roughly 101dB/mW. The cable is a bit longer than standard at 66cm. (An optional 50cm version is available. The jack is a 90º 3.5mm TRS with the strain relief built into the encasement. The cable is a 3 wire twist as it exits the strain relief up to the splitter which is also moulded plastic and has strain reliefs built in on both sides of the splitter. Above the splitter, the wire exits as a 2 wire twist on either side leading to a memory wire and a bi-pin connector at the top end. The Frequency Response was measured using my test system. Keep in mind this is uncompensated and while I use a calibrated mic and soundcard, results are only comparable to other results from the same system. As you can see, FR comes very close to the Target curve with no pronounced spikes or dips. Sub-bass depth is good but rolls-off substantially below about 45Hz. Mid-bass is emphasized but has good speed and detail so doesn't get muddy or thick. It does give the dual a bit of a warm tilt to the signature as the mid-bass and lower mids are both foward and become the dominant feature of the signature. I can say the bass is not uncharacteristic of bass provided by a BA, but the Sonion driver used in this product is a bit better than most I have heard at digging to a reasonable depth of sub-bass and at the same time not losing tonality in the mid-bass to do so. This is impressive. The Dual is mid forward and pushes vocals to the forefront of the signature regardless of gender. Detail is good with acoustic guitar sounding just slightly more natural than electrics. Lower treble of the Dual is mildly forward with good detail and gives percussion good snap. As you move up the scale, treble drops back in-line with the rest of the signature first and then rolls off substantially about about 13kHz. Cymbals are well rendered without a lot of sizzle or metallic click to them. I found no tendency toward sibilance or stridency unless the track has it recorded in and in those cases the Dual is capable of reproducing it accurately. Overall, the treble is a good balance between enough energy to sound open and clean without becoming fatiguing. The soundstage is well proportioned and only slightly wider than deep with some sense of height. Instrument separation and placement is good and seating the orchestra in your head for the most part matches the actual seating arrangement although at times neighbors seem slightly in front or behind each other rather than side by side. This is especially true as ensembles get larger and tracks get more complicated. Imaging is above average with footfalls and other spatial references being well placed. Layering is good with little congestion until tracks get extremely complicated. I started out by admitting that the universal had been something I had thought made a lot of sense from the outset, so I will admit my bias right up front. I think any company making customs would be well served to make a similarly tuned universal model for use as a backup pair for bands or use among members of worship teams that alternate personnel, etc. This also gives people a way to try out an earphone made by that company without the level of commitment of a full custom. Admittedly some can be re-shelled, but not without a high cost and universals resell much more quickly on most of the trade boards I have used over the years. Soundwise, the dual offers a fuller sound than expected with good detail and clarity in the mids and upper range and some slam in the bass. No, these wont please the basshead crowd, but for those looking for a fun tuning with lots of detail, they offer a lot. For those with a set of Eartech customs, the universal offers a less expensive backup pair with a similar tuning and for worship teams or bands with alternating personnel, having a few sets of universals is much more economical than purchasing customs. 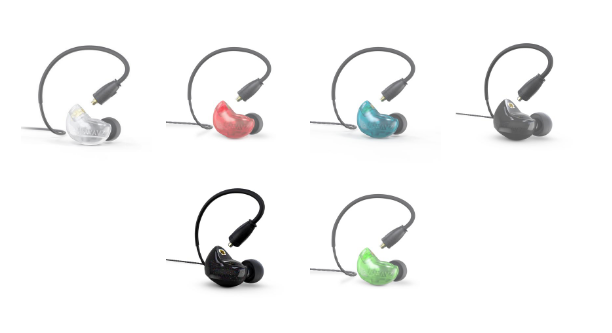 For those of us that are not performers and just want a really good quality set of in-ears that don't cost so much that we worry about taking them outside or wearing them at the gym, the Eartech Universal Dual is a solid offering starting at $199.